Data’s nothing new to the sales landscape. In fact, sales teams have more information at their disposal than ever before, using data to do everything from identifying opportunities to improving performance. Yet even with all that data, so many sales teams still struggle to close deals and hit quotas. Why is that? 10% of respondents aren’t sure if they are using a sales management system. 67% of salespeople believe that their selling process needs improvement. 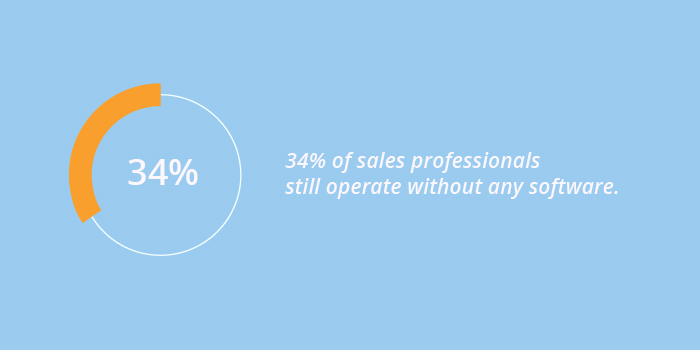 And a whopping 34% of sales professionals are still operating without any software at all. It’s obvious that data isn’t the only thing sales teams need to truly be successful. They need the right sales tracking software to help them make sense of the data they have and use it to their advantage. When your sales platform delivers more than numbers, your sales teams do more than crush quotas—they generate more leads, turn insights into opportunities, and ultimately convert more prospects into customers. Check out these 5 ways sales software can create a better experience for both sales reps and prospects, ultimately helping to get more deals out of the pipeline and across the finish line. A sales management platform brings all your sales metrics together into one place so you can see everything in context. The right software can help illustrate where the buyer is in their journey and give the salesperson the context they need to speak to the individual needs of the customer and shape the buying process. The right tools will give sales teams a better understanding of the prospects in their sales funnel, which will in turn shape the sales strategy and process, and improve customer satisfaction. 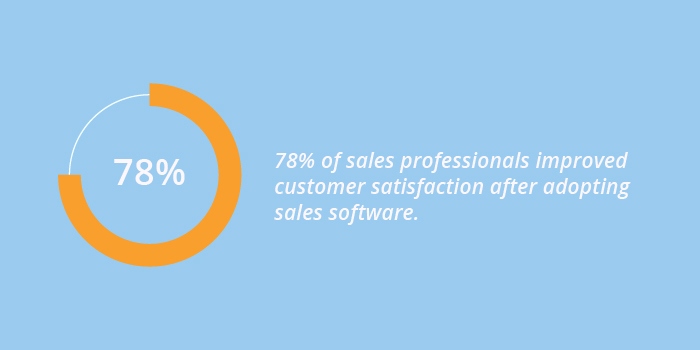 So much so, in fact, that according to GetApp’s study, sales teams saw a 78% increase in customer satisfaction after adopting sales software. When you get a more holistic view of your sales funnel, it becomes easier to see what’s coming up in the pipeline, what’s already there, and which deals are most at risk. Sales software gives you the ability to analyze all relevant data at every point in the sales funnel while delivering the predictive analytics you need to determine what’s down the road. Without up-to-date, accurate data, it’s nearly impossible to predict future sales, not to mention the fact that sales leaders often have to wait for someone else to get them data they don’t have access to. Without the tools to sort hot leads from cold, sales leaders are oftentimes overwhelmed with a flood of data that’s nearly impossible to gain insights from. This forces them to resort to treating all leads the same, oftentimes overlooking opportunities and wasting time nurturing stale leads. Sales software gives sales reps insight into which leads are more likely to qualify, which deals are at risk, and which are most likely to close. Ultimately, adopting sales software that helps differentiate leads has led sales teams to see an 86% increase in revenue. It’s easy for sales teams to get bogged down with time-consuming manual processes. Not only do manual processes take time away from selling, they are error-prone and difficult to gain insights from. 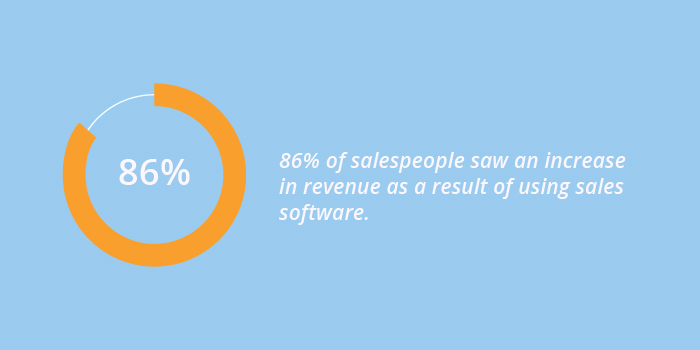 GetApp’s survey found that 95% of sales teams saw an increase in productivity with sales management software, in part because the software helps automate time-consuming processes, allowing sales teams to spend more time to focus on prospecting and selling, and ultimately close deals quicker. A sales team is only as good as the training it receives. 92% of respondents to in the GetApp survey reported increased selling ability thanks to training they received once sales software was adopted. Not only does software help sales leaders track and differentiate leads, it helps them track the productivity and success of their sales reps, identifying which reps are excelling and which are falling behind. This highlights where to improved training is needed and which training programs are successful. Want to learn more? Read the full GetApp report here. Domo helps sales teams gain the insights they need to enhance their pipeline, forecast more effectively, and increase revenue with real-time visibility into the sales funnel. To learn more about the impact Domo has had on its customers, check out Forrester’s Total Impact of Domo report.